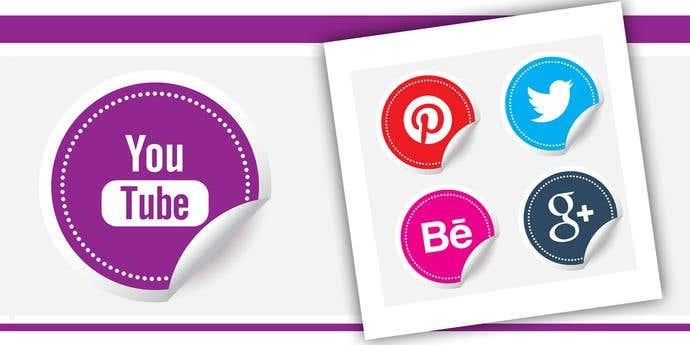 Are you looking to add visuals to your messages? Using icons in your messages is a great way to communicate with users and can help engage customers with your content. Not only will they add variation, they can influence the mood of your customer, brighten up the content and bring your words to life. 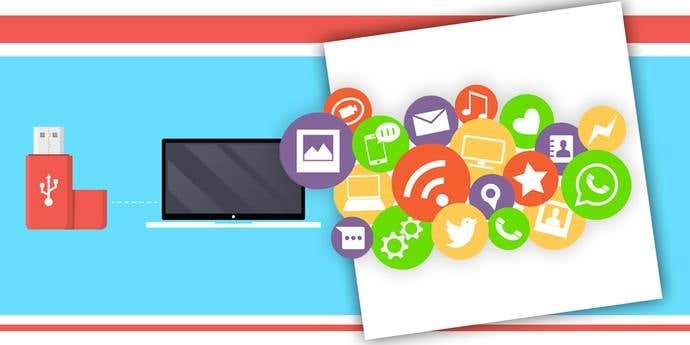 Icons are not only useful in the digital world for websites, web applications or digital presentations, but are handy for items such as menus, pamphlets, business cards, posters, and projects. 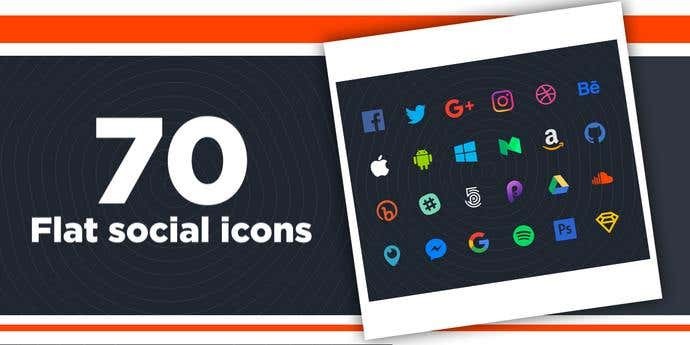 For the best free icon web packages, we’ve provided the following 50 stunning icon packs for any project - big or small! 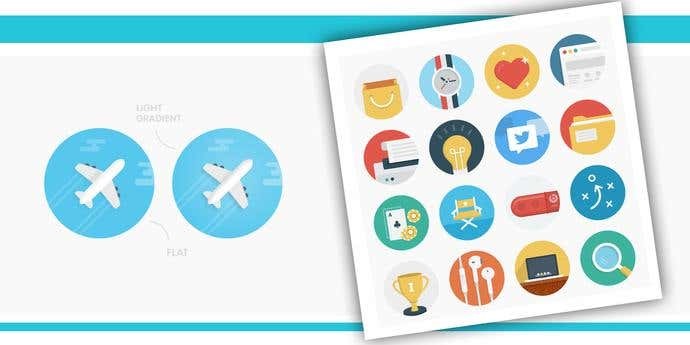 Designed at Vecteezy, these flat designer icons use the simplicity of geometrical shapes and complementary colours to create impactful images. 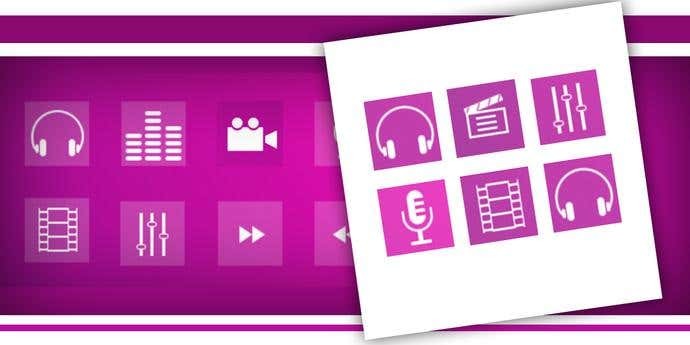 The available icons mostly consist of digital application images. The rounded curves of each shape add a consistent element to any project. 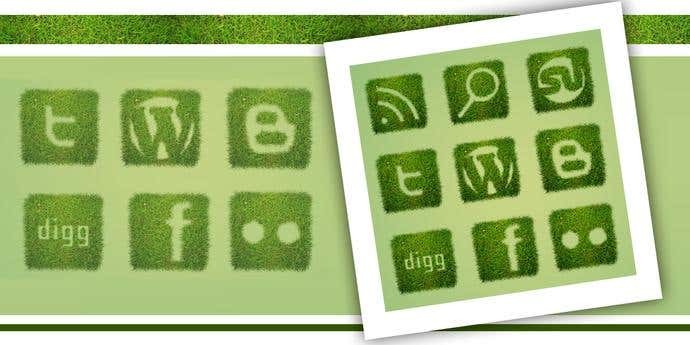 This basic social media icon set, designed by Rogie is available in five different styles and shapes. They can be found in the forms of a circle, rounded square, square, monochrome and borderless. 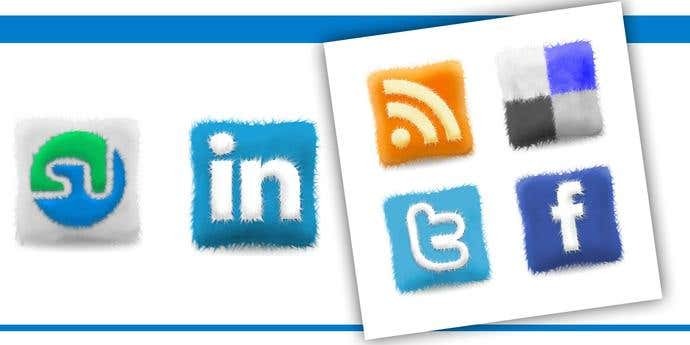 This icon set created by Andrea Austoni is available for Facebook, LinkedIn, RSS, Delicious, StumbleUpon and Twitter. 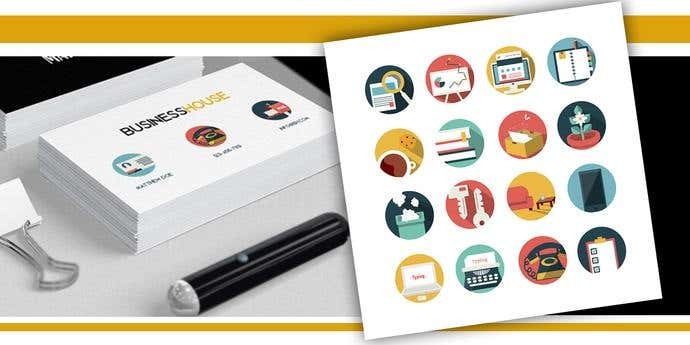 It’s cushion like effect makes for a distinct package and will add individuality to your page. 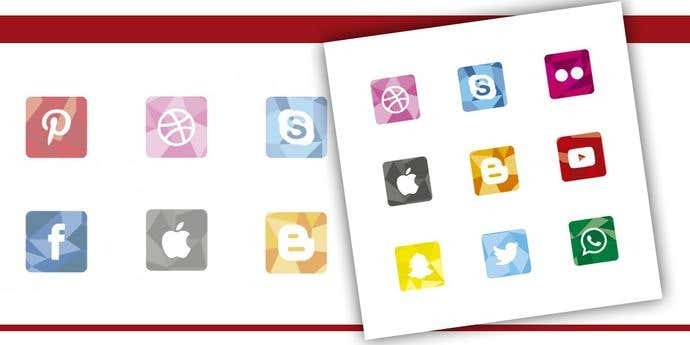 Each icon is available in four sizes and can be downloaded as transparent PNG’s. This quirky icon set, designed by Oxygenna, applies a simple white background to popular drinks. This style adds a subtle touch to the content, without distracting the reader from the text. This set is available to download in sepia and colour and in three formats including PSD, AI and PNG. 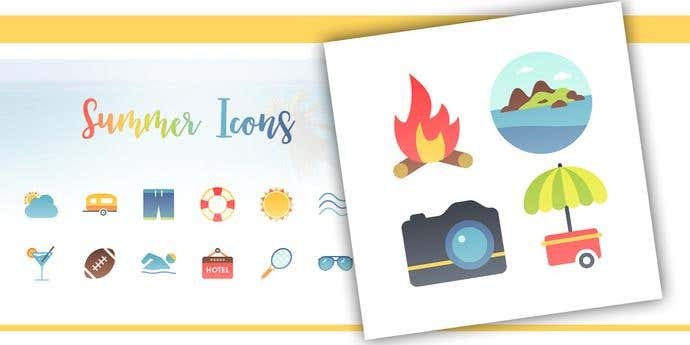 Designed for summer by the design team at Printerinks.com, this summer icon set provides happy and lively summer vibes to your content. 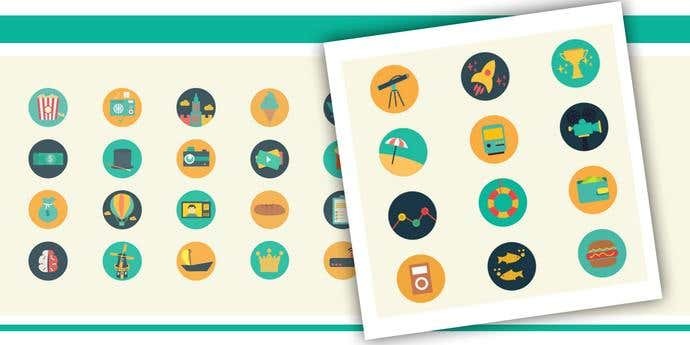 Each icon represents a fun location or activity and is ideal to use with content related to tourism, recreation or hobbies. 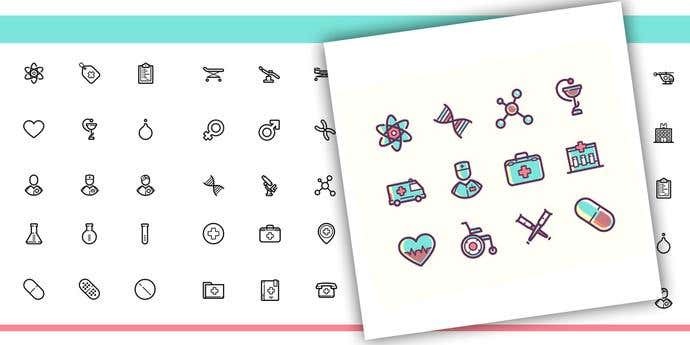 This set has 40 icons that can be modified and available to download in six formats including PNG, PDF, PSD, EPS, AI and SVG. This social media icon set, designed by Jelio Dimitrov, contrasts light and dark versions of neutral colours to display sophisticated and easy-to-understand symbols. 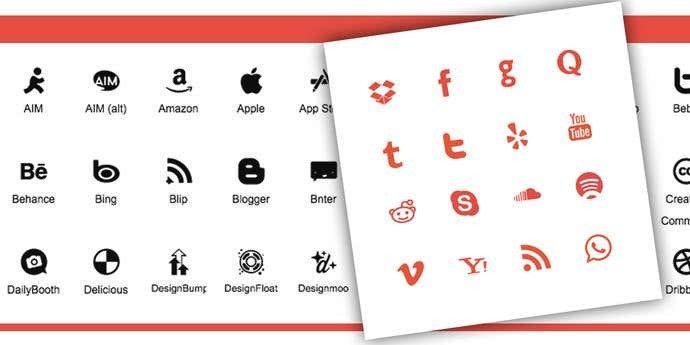 This package includes 74 social media icons where many rely on the simplicity of a single letter. Lower-cased icon symbols are enclosed in a circle, while those in uppercase are borderless. This Paint Splatter icon set, designed by Vecteezy, features a splatter of paint outline and encircles traditional social media symbols. The whites of each symbol complements the bright colours of each splatter. This combination provides a contemporary and fun tone to the icon pack. This flat icon set, designed by Graphic Burger, features vibrant icons with square borders and diagonal shadowing. 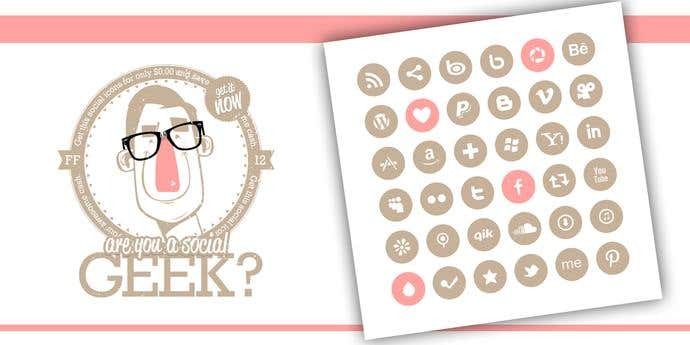 This set provides 40 different social media icons inspired by Google and are available in four different sizes. 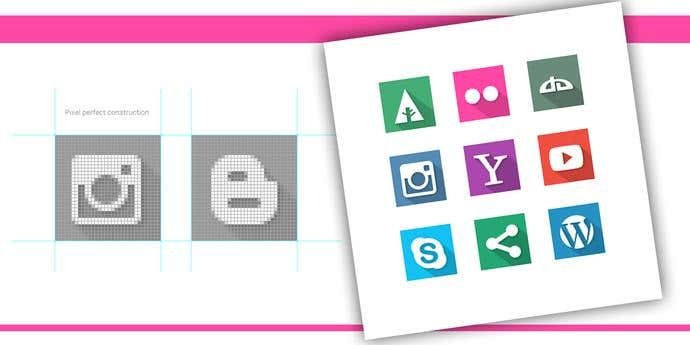 This icon set, designed by Vecteezy, features a material badge with a fine stitch border. The stitch effect that borders each symbol accentuates the icon as a whole and makes it pop from the page. This icon set, designed by Richie Thimmaiah, offers a ‘green’ feel to the text, making it ideal for content exploring environmental or nature based ideas. 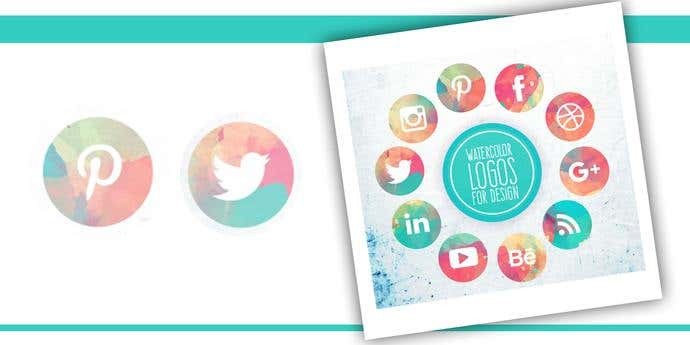 This set of 12 different social media icons is available in four different sizes. 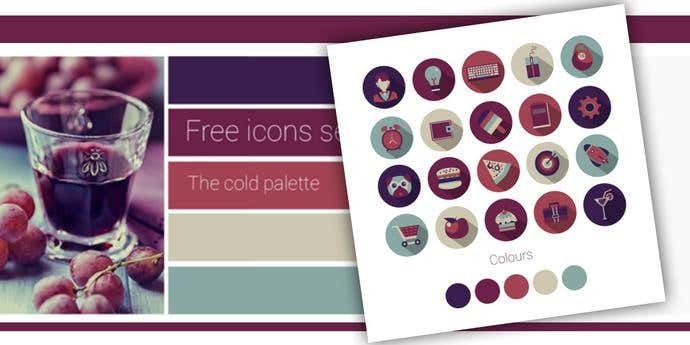 This watercolor icon set, designed by Vecteezy creates a soft and artistic tone to the icons. The shades of blue and green spread across the background accentuates the white symbols. Their uneven border emulates the effects of a signed scroll, adding a touch of antiquity and makes for an overall vintage style. 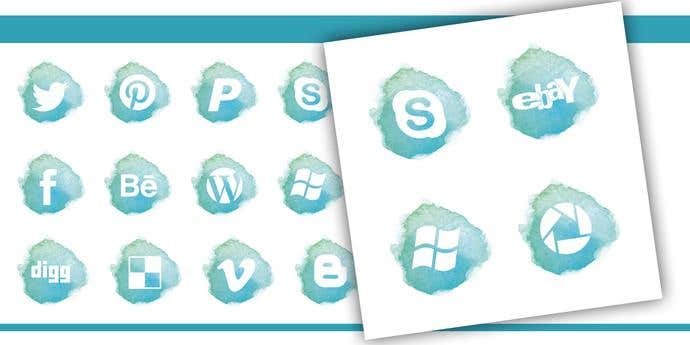 This social media icon set, designed by Vecteezy features a 3D effect with it’s curved peel corner. The sticker style of the icon adds a playful, childish tone, reminiscent of a childhood desire to collect stickers. This icon set, designed by Alex Peattie, provides monochrome symbols that can be edited and scaled to any size. 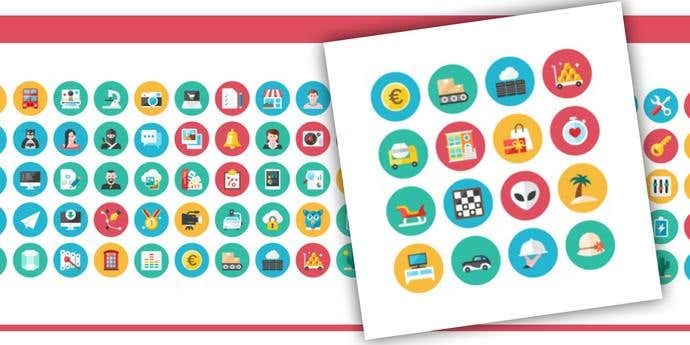 This set includes 150 simple icons available in Al, EPS, PNG and SVG. The curves of each icon adds a soft tone to the page and its simplicity guides readers to the right location. 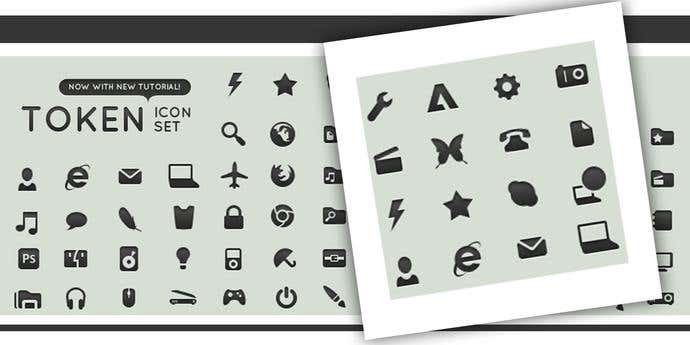 This Web Projects icon set designed by Funline, features clip art style icons. There are 72 icons available representing a variety of themes including real estate, home appliances and web projects. This set features uniform colour themes but also provides variety for the size, shape and thickness of the line gradients. 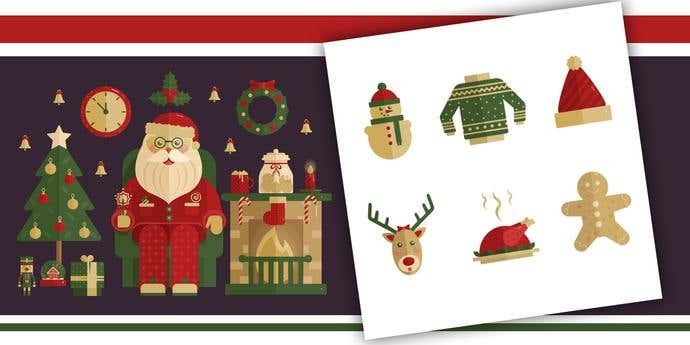 This Christmas icon set, designed by Anastasia Kolisnichenko, is ideal for any Christmas project, whether online or on paper. These 110 cute images range from chimneys and bells to gingerbread men. The traditional Christmas colours of red, green and gold are applied. 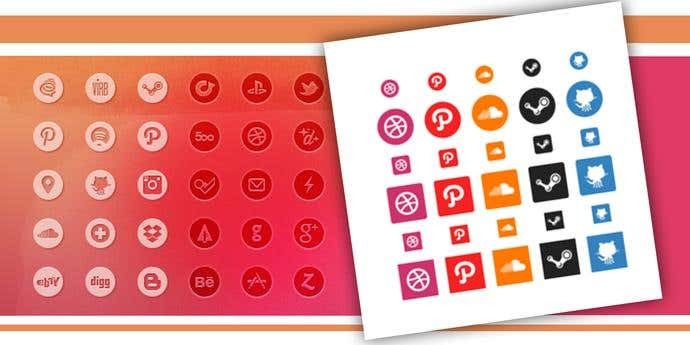 Each icon is available in four different formats including AI, PSD, PNG and EPS. 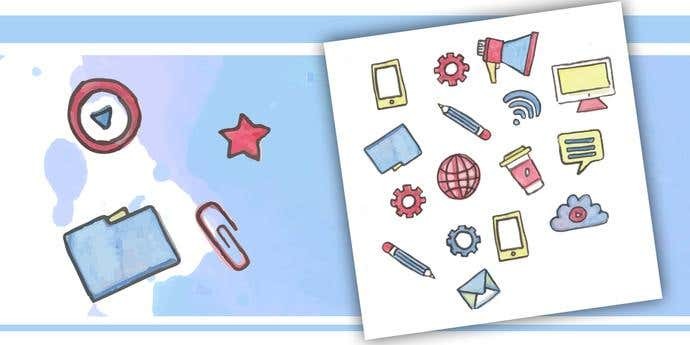 This Office icon set, designed by Manuella Langella, provides artistics icons ideal for any representation of office and business tools. Each icon is circular and consistent with vibrant colours.This set is available in five formats including AI, EPS, PSD, PDF and SVG. 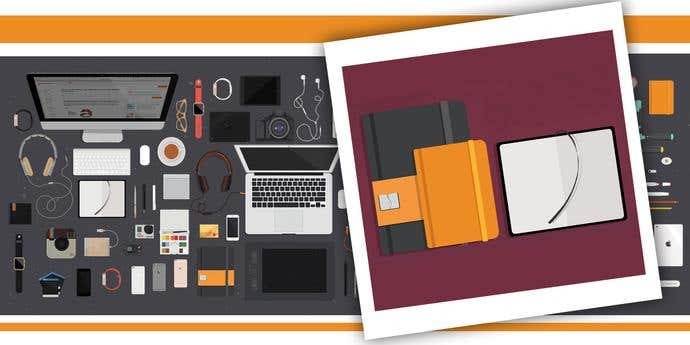 This technology and workplace icon set, designed by Anastasia Kolisnichenko, provides clean and neat images of workspace items ranging from tablets and headphones, to pens, coffee cups and cookies. This set is available in five formats including AI, PNG, PSD, EPS and SVG, each with modifiable capabilities. 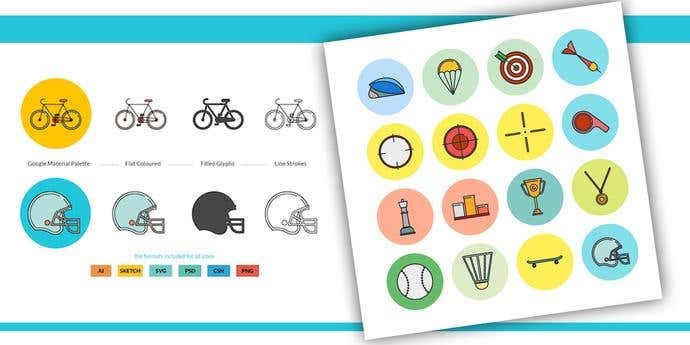 This icon set, designed by Ramy Wafaa, provides fun and colourful icons related to sporting activities. This set of 40 icons offers diverse variations in colour palettes, line strokes, filled glyphs and optional circular borders. Each style is available in four different sizes. This icon set, designed by PixelBuddha, provides a collection of everyday items, ready to complement any text. This set is available in two styles of flat and light gradient. The neatness and simplicity adds a tone of sophistication to any project. This unique set designed by IconSet, provides 52 flags of the world. Their circular shapes adds a creative element to your project and magnifies the image of the flag. 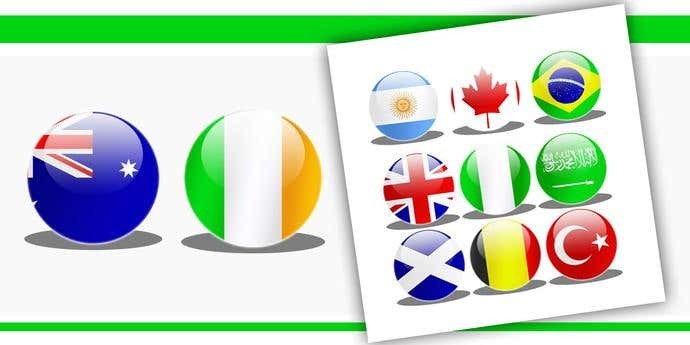 The bright colours of each flag enhances the icons and attracts the customer. This Cold Palette icon set, designed by Inna Mukha, provides a range of images in deep pastel colours that add a tone of sophistication to the text. The illustrations, ranging from food, to workplace items to means of transport break up the monotony of any straight text. This icon set, designed by Fresh Design, pays tribute to its name and provides fresh images of healthy foods. The consistent white circular borders enhance the colours of the fruit and vegetables presented in the middle of the image. 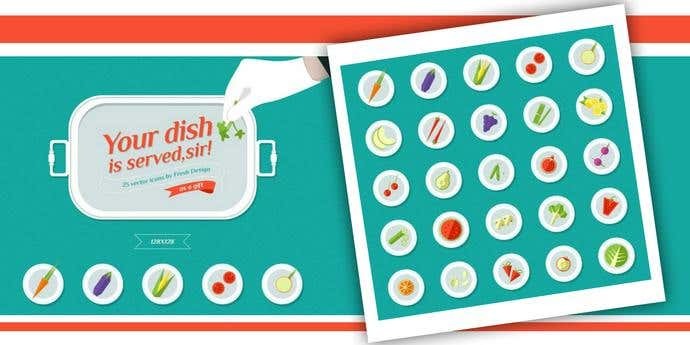 This set is ideal for any text about food, whether that is a blog, a recipe or game app. 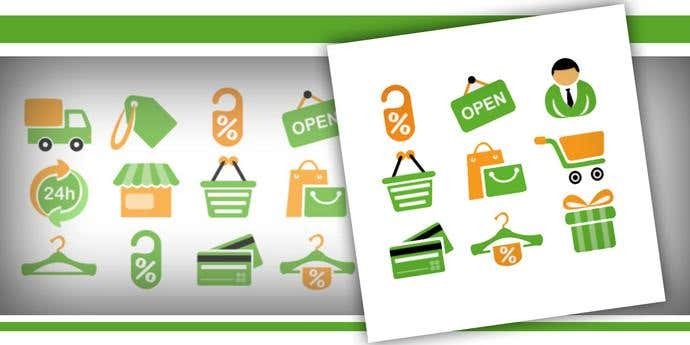 This icon set, released with Duck Files, employs bright green and orange colours to present all images shopping related. This style is ideal for online stores and marketing graphics as their bright colours pop from the page, attracting the reader. This set is available in two formats of PSD and PNG. 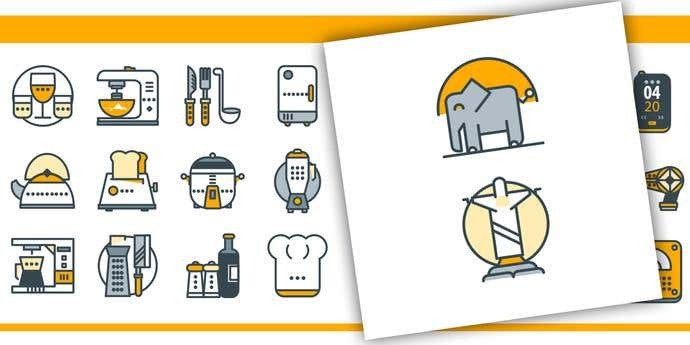 This icon set, designed by UI Surf, provides cute and happy illustrations for a range of items evolving around science, the environment and technology. Their bright colours and white shading adds an artistic feel to the image and brings the page to life. This set has 40 icons available in three different formats of EPS, SVG, PNG. This Meroo icon set, designed by Hesham Mohamed, combines mostly golds, greens and reds to present fun outdoor activities. The circular border and simple contrasting colours creates an artistic tone to the text. The 110 easily recognisable icons in this set are available to download in PSD. Designed by Vasil Enev, this icon set provides original icons for Apple’s IOS 8th operating system. 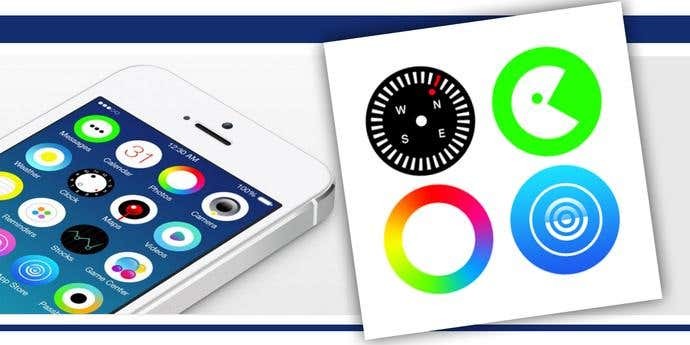 The bright colours and effective use of white makes it pop from the screen and attract the user. This set is available in PNG and PSD. This retro icon set, designed by Efe balun, presents old-fashioned technology through vintage style illustrations playing with varying shades of red. Like its name suggests, the retro effect complements its representing image and makes it an ideal accompaniment for classic and antique websites and sources. This set is available to download in PSD. 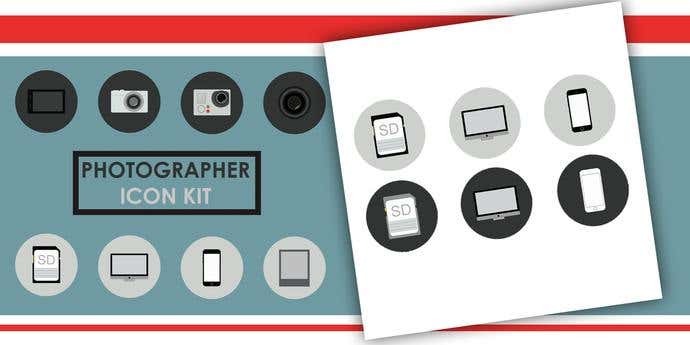 Designed by Eva Mosak, this photographer’s kit presents camera and photography based illustrations, ideally representing any kind of photo based project. Its monochrome colours maintains simplicity for the text while adding a tone of sophistication. 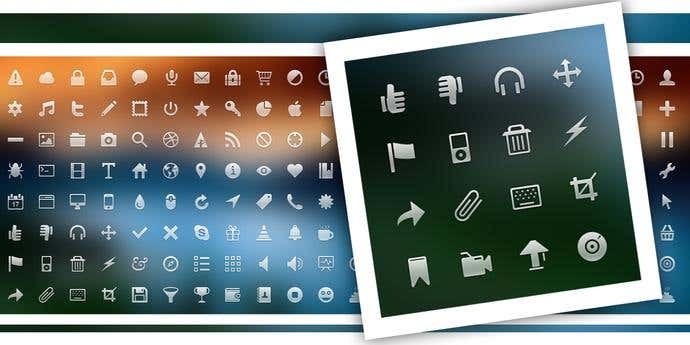 There are 16 icons available to download in PSD format. 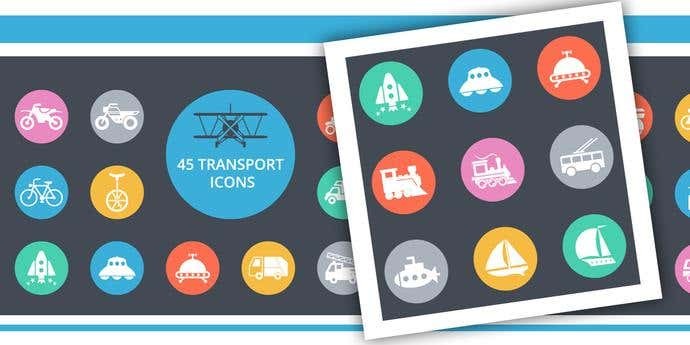 This icon set, designed by GraphicsFuel, provides colourful bubbles of 45 different transport illustrations. The effective use of white contrasting against a bright background, adds a fun tone to the image and helps the icon pop off the page. This set is ideal for a dashboard, an app or any tourism or transport based project and is available to download in AI, PSD and EPS formats. This medical icon set, designed by Yegor Shustov, provides gentle and medical illustrations playing. The smooth lines and soft colours of this set creates a cute representation of each scientific image. This set is available to download in three formats of AI, PSD and EPS. 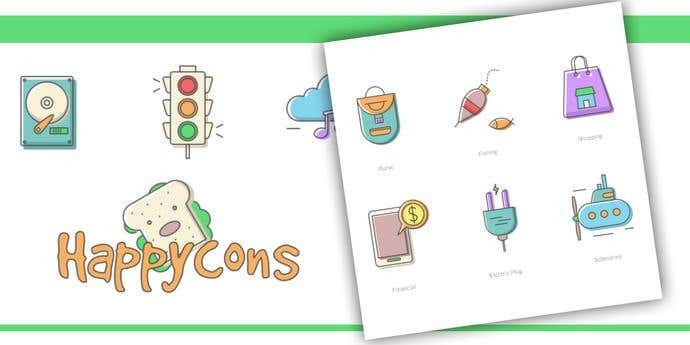 Designed for Free Design File, these eco friendly icons pay tribute to its name by providing illustrations rich in eco-friendly promotion. 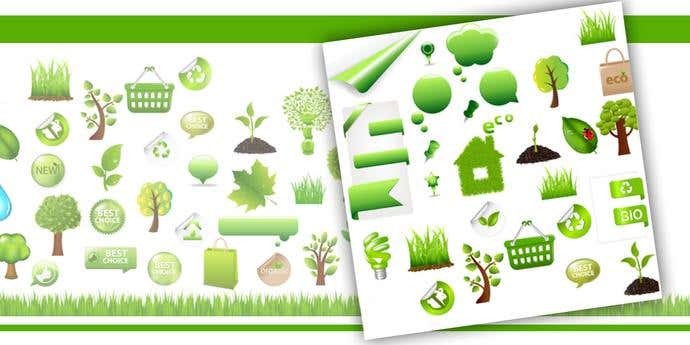 The vibrant greens of each image enhance its “green” message. This set is ideal for content exploring bio living, ecology and environmental issues and is available to download in EPS. This icon set, designed by Vincent Le Moign, has a range of 110 colourful icons presenting a diverse range of illustrations from workmen to instruments and technological gadgets. The bright backgrounds of each icon add a fun and lively tone to the content. 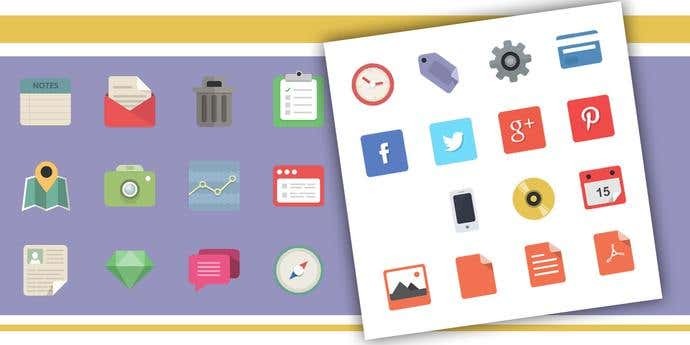 Each icon is available to download in 10 different colour variations and in three formats including Adobe Illustrator, EPS, SVG and Sketch. Designed by Kalachakravarthi, this multimedia icon set exploits the sophistication of the rich purple colours to provide a series of music icons. The white contrasting against the deep purples adds a contemporary tone to the images. This set is available to download in the sketch format. 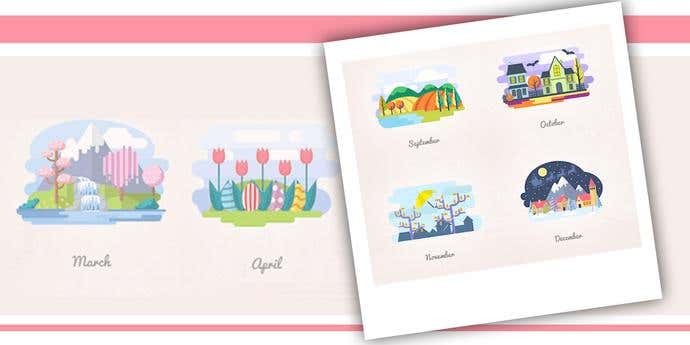 This months and seasons icon set, designed by GraphicMama, provides 12 artistic icons, creatively representing each month of the year. The detailed artwork of each icon creates a personality for each month, which is enhanced with the differing choice of colour combinations. This set is available to download in PNG, SVG, EPS and AI. 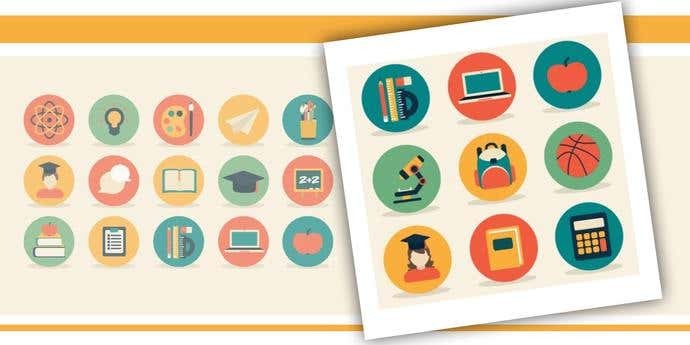 Designed by Freepik, this education icon set uses simple images and bright colours to bring their icons to life. Consistency is maintained in its circular borders, geometric shapes and matte finishing. 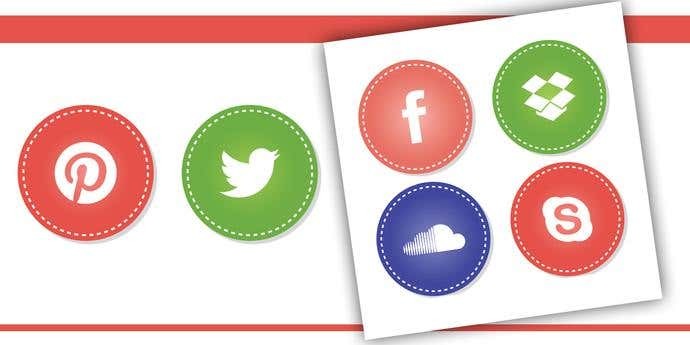 This flat minimalistic icon set, designed through Vecteezy, provides brightly backdropped social media icons. The white of the image contrasts well with the bright background, helping the icon pop of the page and add life to your content. 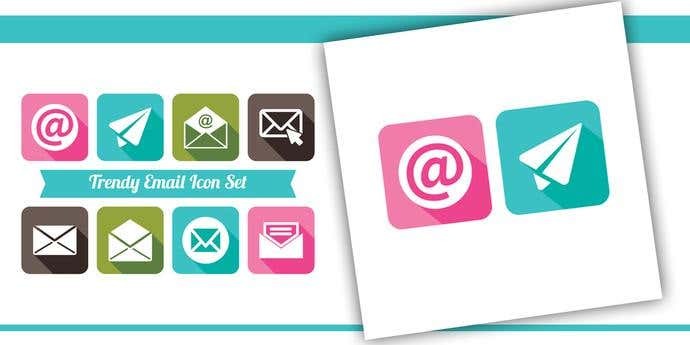 Designed by Vecteezy, this icon set provides a contemporary touch to traditional icons found in your emailing browser. The colourful background and the long darkened shadow coming off each icon adds depth to each image and attracts the user. 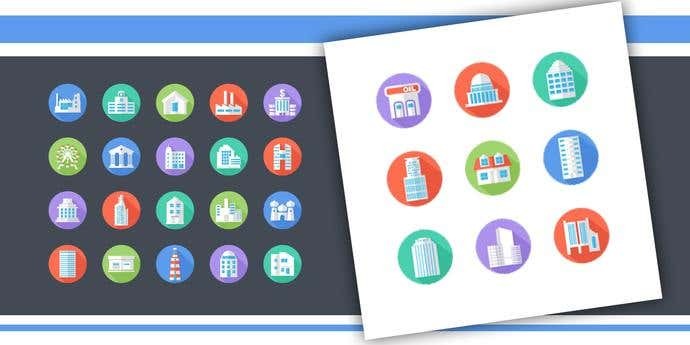 This icon set, created by the designers at Vandelay Design, captures 35 variations of building icons. Each construction, whether house, skyscraper, shop or cultural building is encircled in a matte colour and emits a long shadow coming off the whites of the building. This set is available to download in four formats including AI, APS, PSD and PNG. 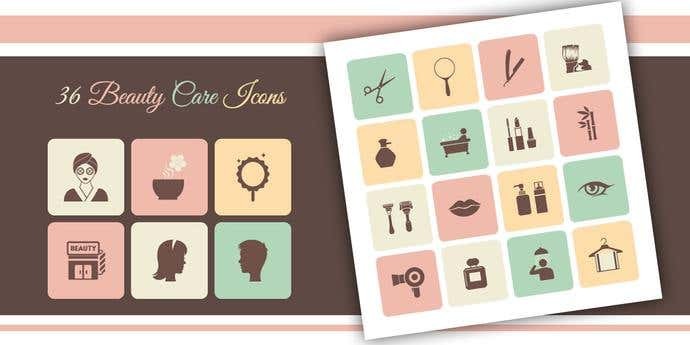 This icon set, designed through Vecteezy, presents 36 petite and feminine beauty icons. The pale colours add a gentle touch to the text, making it ideal for content related to beauty. This set is available to download in AI, EPS and PSD. 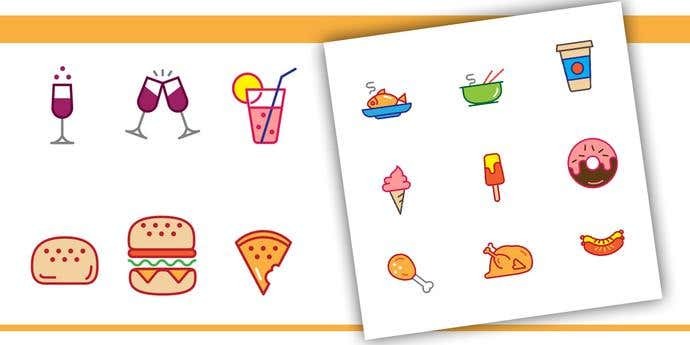 Designed by Rafi, this icon set presents fun and colourful images of food. This set of 18 icons is available in both black and white outlines and colour. The simple set is free to download in AI and EPS. This icon set, designed by Rafi, pays tribute to its name, by providing a hand-drawn touch to your content. 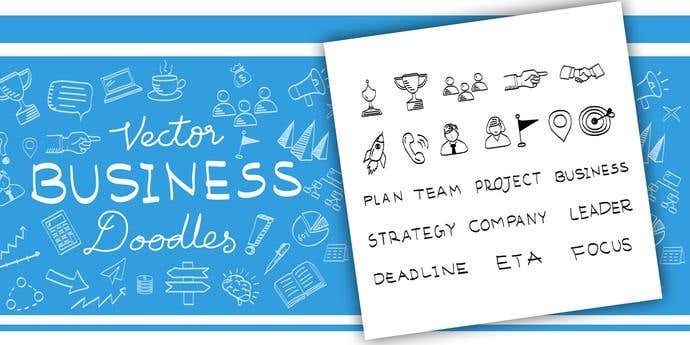 This natural style creates a fun, casual tone to the text and is ideal for visualising your ideas online, in presentations or on paper. This set is available to download in AI, EPS, SVG and PSD. 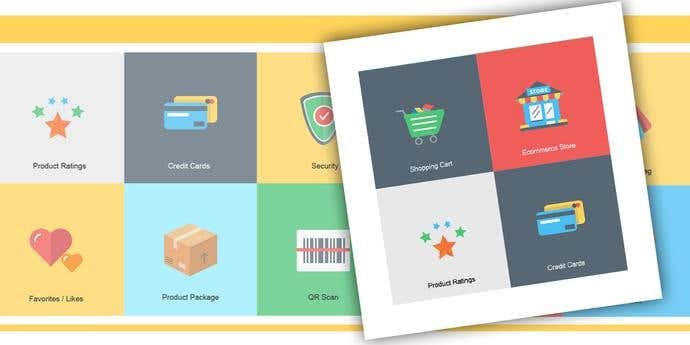 Designed by Rafi, this E-commerce icon set presents simplified images of all 18 representations of online transactions. The softness of its lines and simple colours creates a cute tone to the icon. This style is ideal for online shopping sites and marketing graphics. This set is available to download in AI, EPS, SVG and PDF. This watercolour icon set, designed with Freepik, provides a colourful and fun tone to your content. The watercolour effect imitated in this style adds a slight vintage feel to the text and artistic flavour to the icon, which would be appreciated by a contemporary audience. 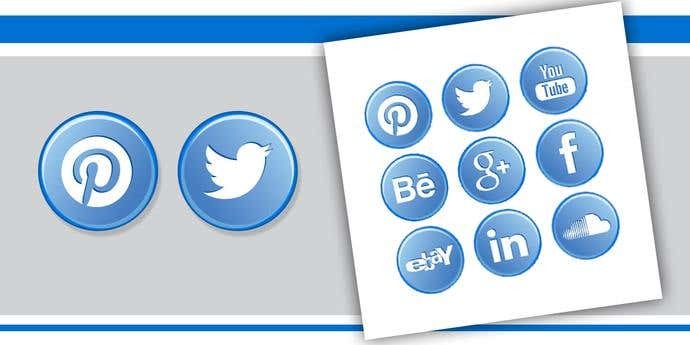 This set complements both online and on paper representations of the primary social media icons. 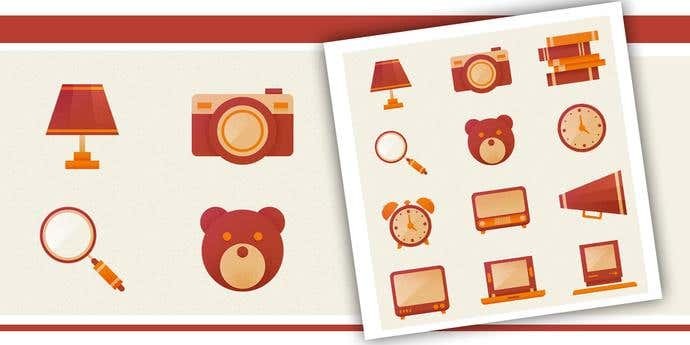 This icon set, designed with Freepik, provides cute ‘hand painted’ icons. The soft pale colours of each image adds a gentle tone to the content. Each icon in this set can be found in two different sizes. Designed by Patrickss, this poligonal icon set presents an abstract, seemingly cubism inspired representation of varying social media icons. The range of backdrop colours nicely compliments the whites of each icon and creates a contemporary tone to the illustration. Designed by Brsev, these minimalistic icons features items for applications, themes and ideas. There are 128 unique symbols available with a light and dark variation. Their one-shade technique creates a tone of sophistication while adding variation to your page or message. This icon set, designed with Dribble, provides a range of symbols in white with a slight transparency. This set includes just about every icon you require to create clear app links across your page. 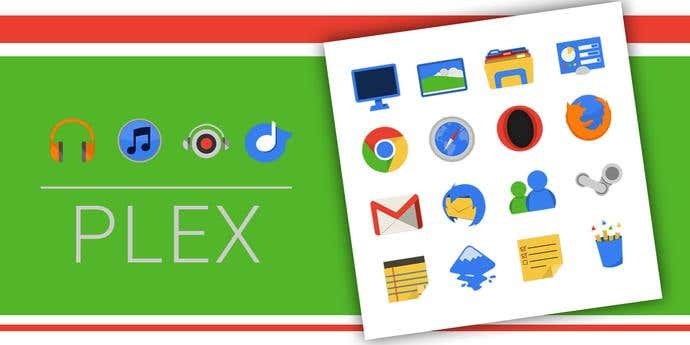 This icon set, designed by Cornmanthe3rd, provides modern symbols in brights colours.The designer matched this set with styles seen in most Google products. This set is ideal if you are looking to add colour to your project. This icon set, designed by Vecteezy, provides consistency in the white and blue colour coordination. It’s circling border with a dark outline contains the image, creating tidiness and sophistication to the icon. 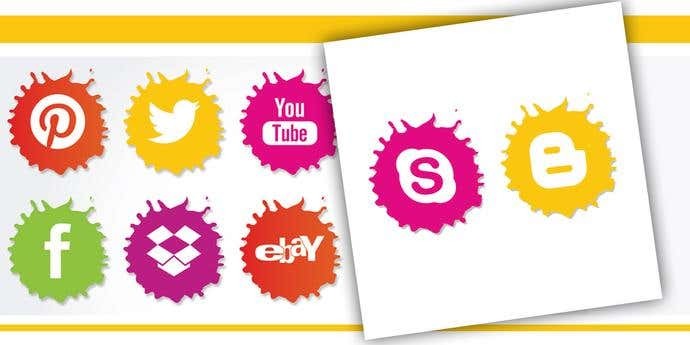 This icon set, designed by Alexis Doreau, uses bright and fun colours to display the social media symbol. The absence of a frame encircling each image makes for strong stand-alone icons. 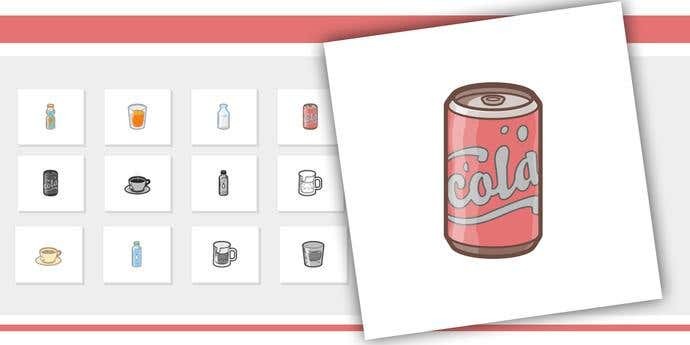 This package provides 70 icons presented against a dark background. Are you looking for a graphic designer? Hiring a graphic designer can be a great way to create stunning designs for a mobile app, website, logo, icon or business card. Simply post a project on Freelancer and you'll receive bids from our talented experts in just seconds!